T-Mobile USA’s HTC HD2 to Bring a Never-Before-Seen Mobile Experience to Entertainment Fans Across the U.S.
T-Mobile will start mobile entertainment with the HTC HD2 in USDuring a press conference at Mobile World Congress today, T-Mobile USA, Inc. announced the creation of a comprehensive mobile entertainment experience for the upcoming HTC HD2, available exclusively in the U.S. from T-Mobile this spring. Offering the largest touch screen on a smartphone in the U.S., the new HTC HD2 will come ready with access to millions of eBooks, movies, television programs and more. The slim and sleek HTC HD2 comes equipped with an industry-leading, high-resolution 4.3-inch capacitive touch display, a blazing-fast 1GHz Snapdragon™ by Qualcomm processor, and support for T-Mobile’s high-speed 3G network for a fast mobile data experience. 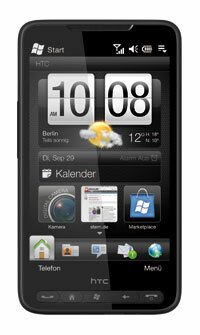 Designed by HTC, the HTC HD2 is also the first Windows phone with HTC Sense™. Barnes & Noble eReader application puts the world’s largest eBookstore in your hand with access to more than a million eBooks, newspapers, magazines and your Barnes & Noble digital library everywhere you go. Enjoy reading on the largest screen available for eReader smartphone software. BLOCKBUSTER on Demand® application is for discovering and downloading the hottest new releases on the go. Blockbuster’s first-ever video download application on a smartphone allows consumers to buy a movie on one device and watch on another connected device through Blockbuster’s library. MobiTV mobile application offers consumers access to live and on-demand TV on their phone — including news, sports and entertainment. Favorite channels such as MTV, NBC, COMEDY CENTRAL, ESPN and more are available for HTC HD2 consumers to watch at home or away. Plus, when HTC HD2 consumers subscribe to MobiTV, their first 30 days of service are free. Paramount Pictures’ popular films “Transformers” and “Transformers: Revenge of the Fallen” come pre-loaded on the device’s memory card and optimized for viewing on the HTC HD2’s high-resolution screen. Gogo® Inflight Internet service offers consumers who purchase the HTC HD2 an added bonus: up to six months of free in-flight Wi-Fi access on their device, with Internet access on 2,500 daily flights in the continental U.S. and growing. In addition to the comprehensive entertainment features of the device, the HTC HD2 delivers advanced phone features including Windows Mobile 6.5 operating system, GPS functionality with access to turn-by-turn navigation from TeleNav GPS Navigator™, a Web browser, a pre-installed 16 GB microSD card, and an advanced 5 megapixel autofocus camera with dual LED flash for capturing images, even in dim conditions. The HTC HD2 is expected to be available in the U.S. exclusively to T-Mobile customers this spring. More details will be available at http://www.sticktogether.com/htchd2.